Okigusuri is a drug sales system in Japan that started at Toyama Prefecture in the Edo period (17th-19th century) and has carried through to today. Until universal health coverage was established in Japan in 1961, Okigusuri was very popular throughout the country. 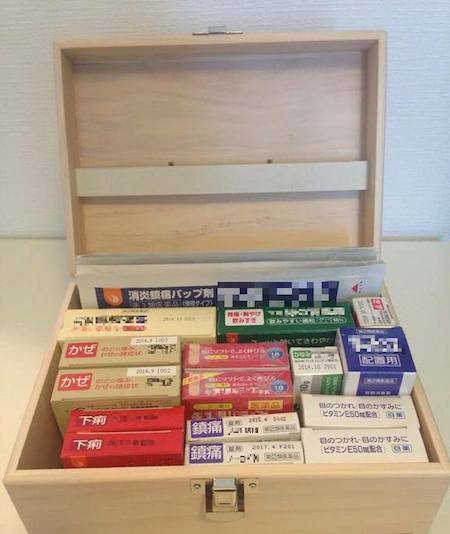 In the Okigusuri system, a pharmaceutical company provides households with Okigusuri boxes which contain medicine used for treating general ailments such as colds, headaches, injuries, diarrhea, etc. Then a member of each household – or client – can use the medicine from the box when they need it, and pay for what they have used when one of the pharmaceutical company staff members visits the household. The provision of the box is free. The staff visits the household once every two to three months, and collects money only for the consumed medicine. The price of each medicine in the box varies from U.S. $4 to $10. This policy is called “senyoukouri,” which means “use first, pay later.” Okigusuri essentially functions as a “home doctor”: People can keep various medicines on hand and use the medicines whenever they need them. This system can prevent patients from having to travel to distant hospitals and waiting for long hours. In Japan, a pharmacist at each pharmaceutical company is available to consult via phone with the people who use Okigusuri. Today, Okigusuri has been exported outside Japan, especially in the Asian region. For example, in Mongolia this system has been set up as a national policy, and in Myanmar and Vietnam it has been utilized to promote self-treatment by using traditional medicine at home in remote areas. In these and other countries, Okigusuri helps prevent the aggravation of health problems and contributes to the dissemination of medical knowledge, since instructions are attached to each medicine in the box. That means the people in each household can learn when and how to take medicine, and they can teach and inform others on how to use these medicines and how to prevent common illnesses through utilizing this system. I worked in infection control in rural Niger for two years as a volunteer with the Japan International Cooperation Agency. I realized that developing countries need not only direct medical aid from overseas, but sustainable health systems that can prevent people from getting serious illness. Before universal health coverage was established in Japan, Okigusuri helped many people in terms of prevention. We at AfriMedico believe this system may be useful in Africa where there is no proper universal health coverage. Due to unstable health systems and poor infrastructure in parts of Africa, access to medical care is an ongoing challenge, especially in rural areas. In remote areas of Africa, Okigusuri may encourage and help a lot of people to take medicine at home, without paying transport fees or under-the-table payments for priority at a hospital. With this system, people in rural areas don’t need to be disappointed that they cannot obtain medicine prescribed at health facilities after they have waited more than several hours to see a doctor. After numerous considerations, AfriMedico focused first on introducing Okigusuri in Tanzania. Tanzania has the potential to grow its economics rapidly because of its stable politics, and is able to import medicines from Japan directly, thanks to its convenient port. In 2014, AfriMedico tested the system, using some medicines that were brought from Japan to Dar es Salaam. The test showed that the Japanese medicines were acceptable and were used to treat simple illness such as the common cold, stomach and muscle pain. In Korogwe, a rural village approximately 300 kilometers from Dar es Salaam, we are trying to introduce Okigusuri at several households and a drug shop as the first pilot. We are currently conducting a feasibility study and are awaiting the results. Eri Machii is founder and chairs the board of AfriMedico.